Wishful thinking and greed – the expression ‘be careful what you wish for’ derives from such stories as this one. 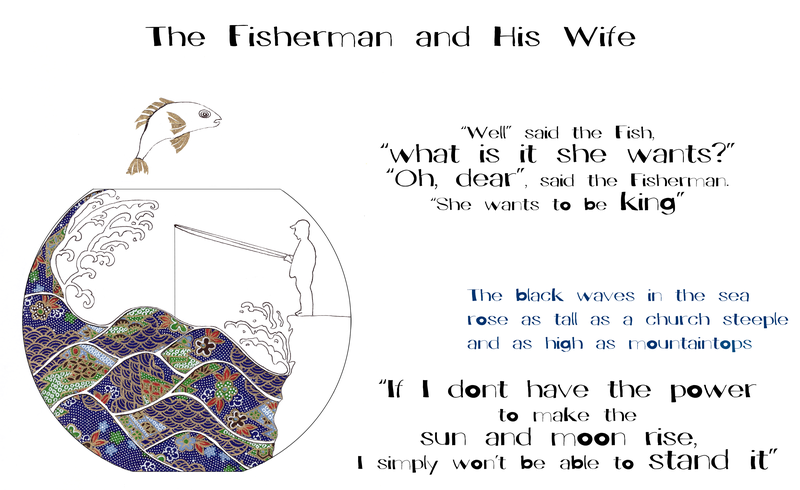 The Fisherman and His Wife is a folk fable that was originally a poem that was received and published by the Grimm brothers. This fable warns against overreaching, betrayal and the dark nature of ambition in relationships. The Fish is bewitched and plays the referee between the Fisherman and his Wife, continuously granting her ever bigger wishes that she forces her husband to ask for on her behalf. With a lot of the Grimms tales they tend to sound comical in parts because they are scripted like a song or poem – you get to know the chorus’s which adds to their allure that keeps you reading. This is particularly the case with this fable, the reluctant husband is going out to the sea each day summoning this great fish and asking for prosperously big wishes to be granted. Inevitably in the end the husband and wife don’t ‘live happily ever after’ living off her wishes, as after all this is no fairy tale.